The Newsworthiness of Death. Biased towards the ‘simple, immediate and spectacular’. the death of a single person (known or unknown), can be understood at the human, person to person scale; we have capacity to feel upset about it. For situations where high numbers of people have died the impact upon us decreases; we tend to no longer relate ‘person to person’. The situation can be too complicated and emotionally difficult to understand and cope with. 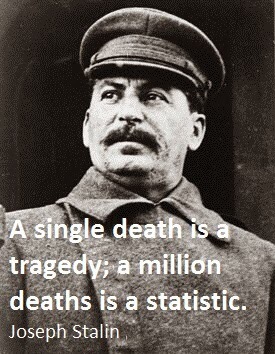 In the words of Stalin, deaths become ‘statistics’. If you are interested in the phenomenon, which has been described as the ‘collapse of compassion’, have a look at this article by Keith Payne in Psychology Today. One Volcano Death is worth 38,920 Food Shortage Deaths. 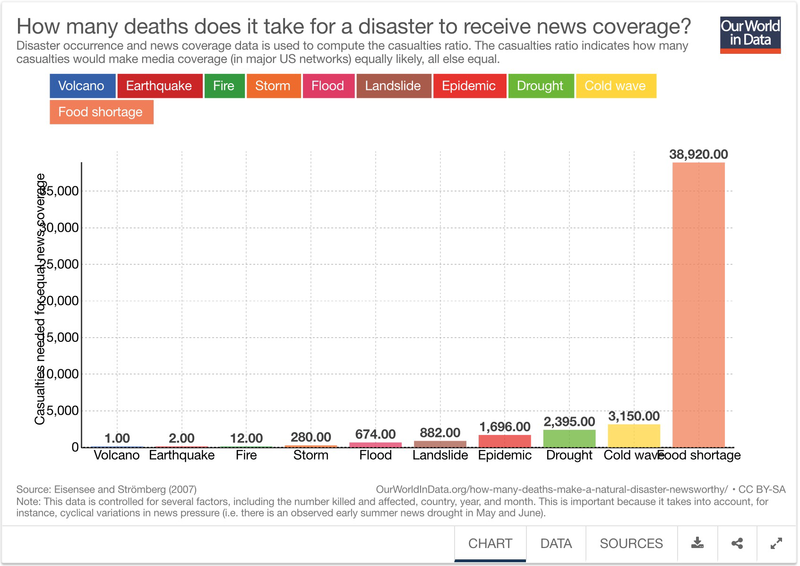 It was reading this post, ‘How many deaths make a natural disaster newsworthy?’ on the Our World in Data blog that reminded me of the Stalin quote. Incidents that were ‘spectacular’ or ‘rife with drama’ were reported ahead of those that were ‘less dramatic’, despite much higher casualties. For example 1 death linked to a volcano (dramatic, rapid and spectacular) would be the equivalent (in newsworthiness terms) to 38,920 deaths linked to food shortages (long-term and definitely not spectacular). The geographic location of a disaster is also relevant. According to the data, 45 times as many people would have to die in Africa for it to have as much news coverage as a single death in Europe. Famine. The worst of both worlds. Included in the analysis was a point about how disasters associated with food shortages often take a relatively long time to develop. However, they only tend to be reported once the situation has become extreme. Taking action to reduce the impact of food shortages, and saving lives, would be more effective if it happened as early as possible. However, relief and support tended to follow reporting by the mass media, and this doesn’t occur until things have become ‘spectacularly’ bad. This feels like a terrible lost opportunity to prevent death and human suffering, partly due to a bias towards reporting the ‘spectacular’ and ‘dramatic’, rather than actual impact on people. When you consider this alongside the ‘collapse of compassion’ phenomenon and Stalin’s Statistics, something like a food shortage really is the worst of all worlds. By the time mainstream media get around to reporting it, deaths have moved on from tragedies to ‘statistics’ in the minds of the mass media consumers. Has Web2.0 and the Internet changed anything? That’s all thoroughly depressing, but something I believe we should think about. I’ve also pondered if the world has changed with the development of multiple channels to share information via the Internet? The Eisensee and Stromberg research looked at 1968-2002 data. Since then editorial ‘control’ and the influence of mass media has apparently declined. With the internet there is far greater scope for concerned people to raise issues sooner, and mobilise action. So has anything changed? Unfortunately I’m not sure about the answer to this question. Based on recent FaceBook posts I’ve seen about flooding in Sierra Leon, some major disasters still appear to be ‘off the news agenda’. Simple and Immediate or Long-Term and Complex. So where does this leave me? In a conversation with Shane Waring (@shanewaring) we came around to the idea that (many) people prefer to deal with information that is immediate and simple, rather than complex and long-term. It is much harder to think about and work through difficult and complex situations. Mental ‘shortcuts’ are much easier, and we can be drawn to the spectacular and short-term and depressingly things then get reduced to ‘statistics’. This cartoon by Wiley Miller at Non Sequitur sums it up perfectly. You may recognise this situation in what you see in the bits of world around you… just saying. It’s not just ‘bad’ news that makes the headlines, it’s ‘spectacular’ bad news. If someone pushes you to make a complex problem ‘simple’, stand back and ask why? Are they ‘simply’ looking for a mental shortcut to avoiding having to do the hard graft of thinking and understanding?